Performance Documentation: The Blank Pages performing ‘Life So Far’ online! Be the Street is shaping up! We now have five community partners in Hilltop working with us to create small performance ensembles: CleanTurn Enterprises, Hilltop YMCA, Our Lady of Guadalupe Center, West High School, and Westland Flea Market. Participants at CleanTurn gather objects for a “Lifelines” exercise in a Be the Street workshop. Photo by Aviva Neff. “The goal is to re-create this project a little further down the road with more objects, potentially as an installation performance,” Aviva said. 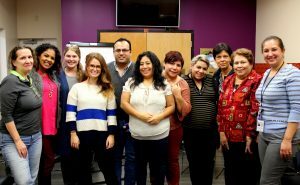 The director of the Our Lady of Guadalupe Center, Ramona Reyes, warmly welcomed OSU faculty member Paloma Martínez-Cruz and graduate students this fall. Reyes participated along with nine women and one intrepid man in two performance workshops led by OSU graduate students Celia Martínez-Sáez (Department of Spanish & Portuguese) and Sydney Varajon (English Department, specialization in Folklore Studies), as well as faculty members from the Department of Spanish & Portuguese, Martínez-Cruz, Elena Foulis, and me (joint appointment with Spanish & Portuguese and Theatre). Participants at the Our Lady of Guadalupe Center after a workshop with Be the Street. Photo by Elena Foulis. Two images in particular have stuck with me from the workshop in which I participated on November 30. While staging short scenes from our lives, one of the participants, Alma, attempted to contort her body into the shape of an old-fashioned telephone so that another participant Tita could “answer” it. This provoked much laughter from the group. In a more realistically staged scene, Elena and Sydney crouched behind chairs, their faces peaking over the tops of the chair-backs, playing kids on Christmas Eve trying to stay awake to see Santa. Jesús played the tree, holding a paper plate with a star drawn it over head. “No te duermas!” [Don’t fall asleep] Elena repeated over and over as first Sydney’s eyes closed and then her own. At the end of the scene, Elena keeled over on her side, sound asleep. Mártinez-Cruz also reached out to West High School this fall, where the performance and Spanish language teachers could not have been more kind or supportive. During the workshop that I attended on November 14, band director Jochen Mcevoy stood in a circle alongside his students, Paloma, and OSU graduate student John Cruz. Along with everyone else, he wriggled his hips during the warm up and bopped up and down from the floor while playing a theater game we learned from the Albany Park Theatre Project training last summer, Pessoa-Cabana-Tempestade [Person-Cabin-Tempest]. In this game, which APTP borrowed from the Brazilian theater artist Augusto Boal, two people form a steeple by standing face-to-face and palm-to-palm. The pessoa huddles under the improvised roof. If the caller calls “pessoa,” only the people under the roofs run. Cabanha: the people making the roof over the crouching people, the pessoas, run and reorganize over other people. Tempestade: We all get up run around, wave our arms, go crazy, do whatever we like for a moment before re-grouping as cabins. 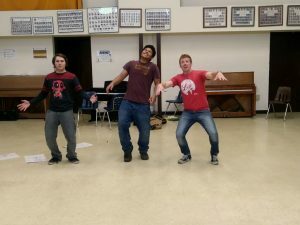 West High’s Theater Teacher Chris Ray also encouraged several of his students to participate in the workshop. The band and theater students exuded energy and commitment to the exercises. We broke up into two groups of four to stage little scenes around the completion of the phrase, “One day in high school…” Our group staged, “One day in high school… I wanted to stage a musical, I was distracted, I was angry, I was bullied.” We all spoke at once, figured out our ideas, and finally settled on starting with a can-can chorus line while we sang “let’s all get along” or something along those lines. One person broke off from the line and looked around as if distracted. Another broke away and stalked off as if angry. Finally we all came back into a huddle to gang up on John, “hitting” and “kicking” him, and shouting insults. Participants in a Be the Street workshop at West High School. Photo by Paloma Martínez-Cruz . Another group came up with four different individual stories rather than a single group scene. The one that remains with me seemed funny in a dark, absurd sort of way: “One day in high school I fell down a flight of stairs.” A young man stands before a “flight of stairs” formed by the bodies of the other three group members. The stairs are formed by the outstretched hands of people of various heights who kneel before him. The young man falls into a loose forward roll over the hands, picks himself up, looks around as if to make sure that no one saw him fall, then walks away in a self-consciously nonchalant manner. At the Westland Flea Market our first workshop, on November 3, almost didn’t happen because we had only one participant, 14-year-old Jackie, who accompanies her parents to the Flea Market on weekends to help with their wedding and quinceañera business. For one reason or another, the four other Flea Market teens who had indicated interest in theater workshops all had last-minute other things to do that day. Yet I remembered that Albany Park Theatre Project founder and Artistic Director David Feiner had told us about how his first theater workshops in a park on Chicago’s northwest side had only a single participant. During our first Flea Market workshop, led by OSU Theatre graduate student Josh Truett and Hilltop community member and library staff Crysti Donavan, Jackie had the full of attention of five adults: Josh, Crysti, Elena Foulis, Annette Jefferson (a retired drama teacher from Hilltop who was there to gather information on the project for a local newspaper), and me. From a name-game, I learned something new: Jackie’s parents got the idea for her name from a Mexican television personality. Yet the birthday game was the highlight of that workshop for me. We broke up into three pairs. Each member of the pair took a turn telling the other a story about their birthday – a story about either a very good birthday or a bad birthday. The pair found three poses to represent that birthday. First, we demonstrated the poses for the full group to get participants’ reactions to what they saw; then each group revealed the story behind the poses. Jackie’s story was about a birthday during which she had to work and got into an argument with her mother. During one memorable pose, she sat and held her face in her hands, as if hiding her tears. Thankfully, subsequent workshops at the Flea Market have attracted more teen participants. 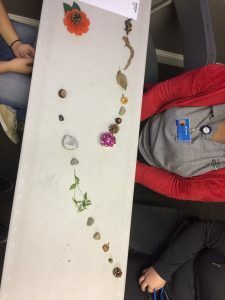 At the Hilltop YMCA, OSU Department of Dance graduate student Katherine Moore and Department of English graduate student Tessa Jacobs (specialization in Folklore Studies) have been taking classes with senior citizens with an eye toward designing their own movement class for seniors. They will teach the class starting in January. Barbara Camfield, the senior program coordinator at the Hilltop YMCA, has helped introduce Katherine and Tessa to the Y’s community. Finally, Westland Flea Market owners Lora and Dale Zinn have been extremely generous with their space, allowing us to conduct workshops on the premises and to plan for a performance that will bring together all of the groups.